European teams should "force the issue" of boycotting the 2018 World Cup in Russia, says former Football Association chairman Lord Triesman. 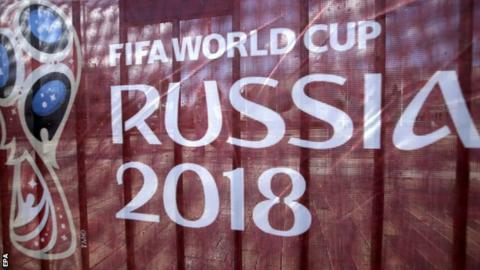 Fifa's awarding of the 2018 and 2022 tournaments to Russia and Qatar remains the subject of corruption investigations in the United States and Switzerland. "It's impossible to investigate the process because the computers have all been destroyed, the documents have all been shredded and nobody will be able to ever form a proper judgement about what happened in the Russian bid," added Triesman, before Saturday's World Cup 2018 draw. The subject of racism in the country came into focus again when FC Ufa midfielder Emmanuel Frimpong was sent off after he reacted to alleged racism during a match against Spartak. Triesman said: "I think it's an absolutely fundamental issue. The idea that you can have a country in which it's entirely commonplace for people to jeer and make unpleasant responses to a player because he's a black player should not be part of our world. He added: "If I was an England fan, much as I would love to see the team play, I don't think I would travel to Russia. I think the problems in that country are enormous."